Corporate sustainability has gone mainstream, and many companies have taken meaningful steps to improve their own environmental performance. But while corporate political actions such as lobbying can have a greater impact on environmental quality, they are ignored in most current sustainability metrics. It is time for these metrics to be expanded to critically assess firms based on the sustainability impacts of their public policy positions. 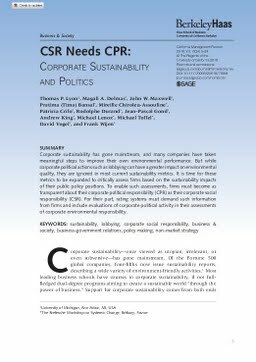 To enable such assessments, firms must become as transparent about their corporate political responsibility (CPR) as their corporate social responsibility (CSR). For their part, rating systems must demand such information from firms and include evaluations of corporate political activity in their assessments of corporate environmental responsibility.